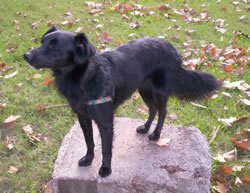 Explore the black dog names list and find a perfect name for your black dog. Even if your dog isn’t black, there are more than 101 cool names to fit any color dog. Do you adore your dog’s luscious black hair and you want its name to reflect it? Or you simply want to spare yourself the hassle of looking for other names and just settle for anything that means black? Simply naming your dog “Black” is not the most unique, but translating it to another language just might do the trick (and even make it fancier). Take a look at more 101 Black Dog Names and find the word “black” translated in a variety of languages from Arabic to Egyptian to Latin. In the list, you will also find names of black food, black animals and other black things that can serve as a very good names for a black dog. Truth be told, one of my favorite black dog names is “Blacky.” That may seem ordinary, but our neighbors had a Black Lab named Blacky when I was growing up. She was great and I loved her name. Below is a list of more than 101 Black dog names and meanings. Take your time and have fun. Angus A delicious meat produced by a certain cattle breed. Anise A Eurasian Herb with aromatic seeds. It is mixed with so many kinds of food. Assam An Indian province that is famous for its fine black tea. Bandit Does your dog love stealing your food? This name would just be perfect. Bear If your dog looks more like a black bear than a dog, this name would be perfect. Beluga A very large sturgeon (Huso huso). Also, a type of whale. Black Jack Great name if you love this card game. Or generally just a lover of any card games. Blacky There is no other name more logical than this for a black dog. This is one of my favorite black dog names because my neighbor had a sweet Black Lab named Blacky. Bootleg As in, black market. Bronson An Anglo-Saxon term that means “son of the dark man.” Fitting if the puppy’s father is also black. Burnt The product of faulty use of fire or heat. Quit burning your toast! Cerny Czechoslovakian name meaning “black.” Another favorite on the black dog names list as my wife is of Czech heritage. Chanyaka Russian for “blackberry” (not the phone). Charcoal Do you love to BBQ? This is a fitting name for black dogs. Cherry You may not think this belongs on the black dog names list, but remember cherry comes in a dark color. Think black cherry ice cream. Yum! Chicory A plant whose root is roasted and ground to make for a substitue for coffee. Chip Like chocolate chip. Or the one used in computers and other electronics. Coffee For owners who are lovers of deliciously bitter black coffee. Coke Love this world-famous black and refreshing drink? Give this name to your dog! Corbin French for “black-haired.” For the elegant and sophisticated dog, like Corbin Bernsen. Cosmos Refers to the unknown black space outside earth (it’s not necessarily black, though, as it is covered with stars and such). Crow A black, loud and scary bird. Darth Vader Fans of Star Wars represent! Domino This is a perfect name if your dog has patches of white in his black fur. Dwayne Gaelic for “little and dark.” Also for fans of one Dwayne Wade (basketball) or Dwayne “The Rock” Johnson (actor). Eclipse A celestial body obscuring the light of another celestial body, as in a solar eclipse. Eightball The only black ball in billiards. Gothic Pertaining to practically anything that is dark and broody and even scary. Goulash A seasoned Hungarian soup or stew of meat and vegetables. Grizzly The bear that is terrifying in real life but cute as stuffed toys and dogs. Hershey For big fans of chocolate (this pertains to you, of course). Inky Very dark. Just like black ink that oozing from your pen (and staining your clothes). Leila Arabic for “dark as a night”. Perfect name for a pretty and dainty female black dog. Matisse Why is this on the black dog names list? Because of Henri Matisse, a French artist known for his use of the color black. Plus, I think the name is really cool! Puck That black circular thingy in hockey that all the players chase after. Raven As in, the large black bird. Reaper Evil creature from the movies. If your dog just as evil? Spade See this suit in your player cards? What color is it? Truffle Why is this on the black dog names list? Think “black truffle,” as in the mushroom. Need proof? Look here. Velvet Perfect for dogs with fur with similar feel to that of velvet. Is your dog white? Find a perfect name for your white dog. Can’t find the name you like on the Black Lab Dog Names list? Don’t give up. Return to big list of puppy names, or the Dog Names by Breed page here to do some more exploring. If you have a great name, tell us about it!